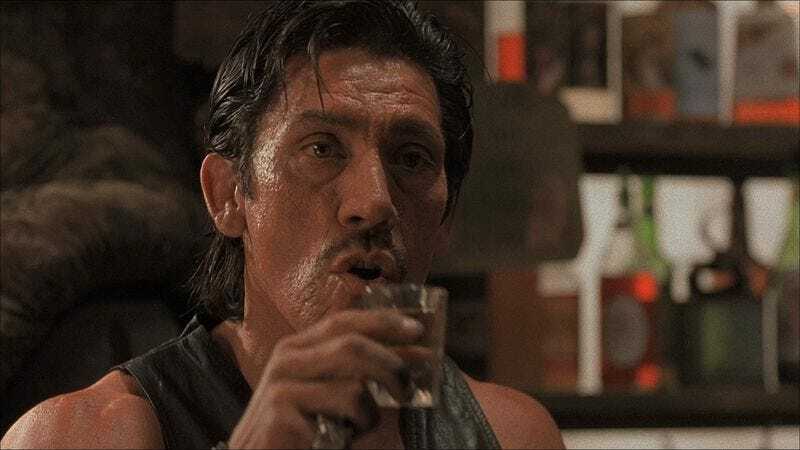 Like a man trapped in a Groundhog Day loop of blood, strippers, and very mean looks, Robert Rodriguez has once again cast Danny Trejo in From Dusk Till Dawn. The Machete star will appear in the second season of From Dusk Till Dawn: The Series, which began airing last year on Rodriguez’s recently launched El Rey Network. The announcement is just the latest in a 20-year collaboration between the two, an ongoing inspiration for those who hope to see peace in our time between angry-looking people and guys who always wear cowboy hats. The pair first worked together in 1995, when Rodriguez cast Trejo in his breakout Hollywood hit, Desperado—a role that helped kick off the actor’s prolific career of intimidating glowering. Since then, Trejo has appeared in the majority of Rodriguez’s movies, including the Spy Kids films and the original From Dusk Till Dawn—a stylish 108-minute trifle that secretly contained the seeds from which a 20-hour miniseries might grow. In a sad note for fans of the original movie, though, Trejo won’t be reprising his role as Razor Charlie, a stone-faced vampire bartender who’s surprisingly open to semantic arguments about Class Two driver’s licenses. Instead, he’ll be playing a new character in the From Dusk Till Dawn ’verse: The Regulator, “a horrifying agent of evil who has been summoned to perform a deadly errand.” Presumably that means something more extreme than a really dangerous trip to the grocery store, because you don’t cast someone with Trejo’s fearsome mien just to pick up an extra carton of eggs. Step Up 2 star Briana Evigan will also be joining the cast as Sonja, a tattoo artist with a sideline in forging passports. This will be Rodriguez’s first time working with Evigan, a novel, potentially unsettling experience the director hopefully will have grappled with by the time shooting commences.